The Texas Senate moved the state one step closer this week to giving craft beer makers more freedom to sell their brews in more places. Under a package of pushed by Sen. Kevin Eltife, R-Tyler, brew pubs would be able to distribute their beer to retailers, and microbreweries like Saint Arnold's in Houston would be able to legally sell beer on site. 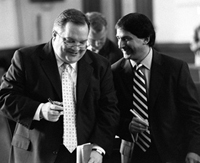 The bills were the result of a deal brokered by Sen. John Carona, R-Dallas, who worked closely with Eltife and Sen. Letica Van de Putte, D-San Antonio, to move the bills through the Business and Commerce Committee. The agreement between craft beermakers and wholesale beer distributors came after a week of tense negotiations. As part of the deal, the Wholesale Beer Distributors of Texas demanded that the small brewers be barred from selling distribution rights. That's something that the small companies could have used to potentially make a significant amount of money from distributors. Craft beer enthusiasts hailed the deal as good for beer, liberty, and Texas. Following the final vote on the bills in the Senate, Sen. Eltife said "Cheers to all." The bills now go to the House where they are expected to pass.